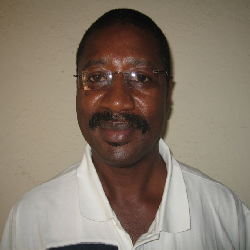 Dr Katcho is the Director General of the Goma Volvanology Observatory Centre in Eastern DRC. He was before the Scientific Director at the Centre de Recherche en Sciences Natrelles (Lwiro, DRC). Since 2007, he us member of the National Scientific Council, Ministry of Scientific Research and technology, D.R.Congo. Ph.D holder in Environmental Physics, Dr Katcho works on energy alternatives to biomass, mainly hydropower, wind, geothermal and solar energy. The work consists of the identification of sites for energy production, to the determination of their potentials taking into account the environmental impact and Cost Benefit Analysis using Remote Sensing and Geographical Information Systems (RS-GIS) tool. Dr Katcho works also on the dynamics of exploited systems, essentially the dynamics of biomass for a given region, on climatic data collection and analysis for early warning. He has an interest in Natural Resource Management in the conflict and post conflict context. Dr Katcho is lecturer in Remote Sensing and GIS, Electromagnetism, Electricity, Special functions and Applied Mathematics in local Universities and supervise students for their research and dissertation.